If you’ve ever watched fireworks, then you know how mesmerizing the view can be. Each tiny light makes its way into the darkness, and two perfectly-timed fuses within a shell perform their duty to create an illuminous masterpiece. If the shell sits in a covered box, protected from anything that might ignite it, then the beauty it contains is never seen. The incredible vision of light it provides is, sadly, never displayed. So how can we do this? Just like the perfectly-timed fuses contained with the shells of fireworks, the Holy Spirit within us can show us the way to spread the Light of the world. Watch for opportunities to share your own faith story in open situations. Always be ready to talk about the hope God has entrusted in you. Be in tune to say the right word at the appropriate time. Take action by serving others and meeting their needs, both physical and spiritual. What a wondrous display of God’s light to live each day intentionally, doing our part to love others! 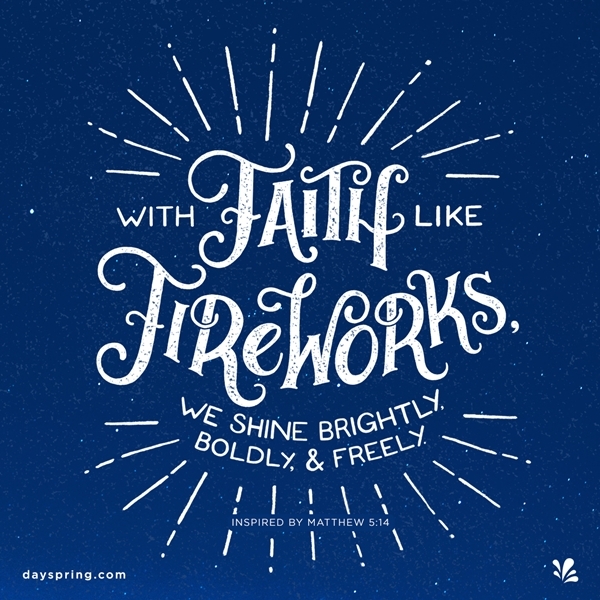 This July 4th, we invite you to be brave and share your faith like fireworks. At DaySpring, we strive to equip people to know and share God’s love in fresh, true and inspiring ways. From our greeting cards to our inspirational mugs, Bible journaling tools, and home décor, it is our hope that these resources will further help you share His Words with others and #LiveYourFaith.